“The Heart of Japan: 62nd Jingu Shikinen Sengu at Ise,” a photo exhibition by Sanjiro Minamikawa, will be on view from Dec. 6 to 27 at the Japanese American Cultural and Community Center’s George J. Doizaki Gallery, 244 S. San Pedro St. in Little Tokyo. Ise is the sacred land said to have been chosen 2,000 years ago by Amaterasu, the deity of the sun, as her home. Over 1,500 ceremonies take place here every year to offer prayers to the well-being of the nation of Japan and her people. All of the food offered during these ceremonies, from the rice and vegetables to the salt, are produced in Ise and carefully prepared by hand to place before a higher power. 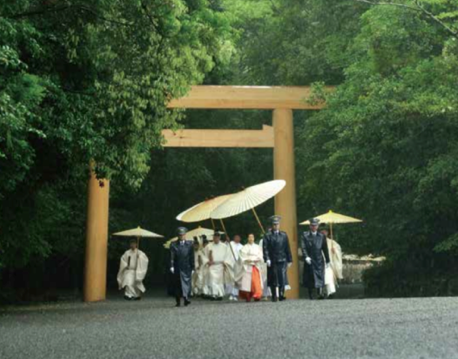 Ise Jingu (Ise Grand Shrine) is a timeless place, ceremonially rebuilt every 20 years using methods preserved since antiquity. This tradition of ceaseless renewal has continued for 1,300 years and endures to this day. The title of the exhibition refers to the transfer of the deity to a newly constructed shrine in prescribed years. Minamikawa was born in Mie. Representative works include “100 Artists in Their Atelier,” consisting of photographs of art masters of the later 20th century and their studios, including Joan Miro, Marc Chagall, Salvador Dali, and de Chirico, and photographs of European and American mystery writers such as Ed McBain, Graham Greene, Frederick Forsyth and Michael Crichton in their studies. Minamikawa was the first non-French foreigner permitted to photograph all aspects of Versailles Palace, a world heritage site, for “Chateau de Versailles.” For the past few years, he has been engaged with the ceremony at Ise Jingu. For more information on the photographer, visit www.s-minamikawa.com. Opening reception will be held on Saturday, Dec. 6, from 1 to 3 p.m. Gallery hours: Tuesday to Friday, 12 to 5 p.m.; Saturday and Sunday, 11 a.m. to 4 p.m.; closed Mondays and holidays.